TiVo partnered with Amazon in March of 2007 to offer downloads of movies and TV shows to TiVo DVRs. Amazon calls this service Amazon Unbox. Amazon hosts videos for download, and users can either rent or purchase the downloads rentals are available on the user's DVR or computer for 30 days, and expire exactly 24 hours after viewing begins. Amazon highlights the TiVo DVR as their top hardware for use with their Unbox service. A TiVo DVR really is an ideal hardware platform for this type of video download service. It's a full computer inside, so it's smart enough and can be adapted to handle this type of transaction, complete with password encryption. Since it's on a network (required for this service) the download goes directly to the box without needing an intermediary computer as a stopover point. So the download comes right to the user's entertainment center, and can even be watched as it's still buffering the download. Pricing for downloads generally ranges from $.99 to $3.99 for rentals, and most movies cost $14.99 to purchase through this service. Occasionally videos are only available for either rental or purchase, but not both options. Movies are generally first available through this service at the same time that they are released to cable and satellite providers under PayPerView premium services. 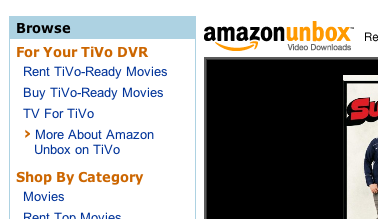 Video may be rented or purchased either on Amazon's website or through the TiVo interface. Either way, the user first has to link the Amazon and TiVo accounts. If the browsing and committing is done through the TiVo interface, the user is prompted to enter their Amazon account information; it is then clear which DVR the user requests for the download. If initiated on the website, Amazon will ask the user to specify a DVR for download if there are more than one on the account. Currently, the digital downloads through the Unbox service are very high quality, but are not at the HD level. Amazon considers these versions to be better quality than a Series2 standard definition recording at the highest quality, and user reviews generally agree. Occasionally, a certain video does seem to be digitized at a lower quality level. TiVo had announced a deal for this type of download service with Netflix, a natural partner here, in September of 2004. Nothing came of the alliance, and by October of 2005, the deal was widely believed to be dead based on Netflix's remarks. It's unclear why this deal foundered. TiVo and Amazon have seen more and more competition on this front (Vudu, iTunes and AppleTV) but they were really the first to be fully up and running, and they are currently believed to be the largest downloader of movies - and behind Apple on TV content. TiVo is unlikely to partner with Apple since Apple has released hardware - the AppleTV - that competes with TiVo in the video download space.